“La Grande Classique Paris-Versailles” offers you the opportunity to develop team spirit within your company. You are in charge of a general management, a sales team, a works council … : then offer your employees and also your clients a unique moment on a mythical race : Paris-Versailles. We invite you to consult this analysis of Sport in Business by the Center of Strategic Analysis : How can sport be put at the service of workers’ health ? Think of cherishing your guests on arrival by offering a moment of relaxation and exchange in a private setting on the avenue de Paris. You benefit from the availability of the registration module reserved for companies. After validation of the order form, we will send you your username and password. Payment is made only by bank transfer from the company after receipt of the invoice. This module allows you to register your employees until June 30th (subject to availability of space) and then to manage each runner’s record until the closing date of this module : August 31st. A runner can be replaced under the condition that the replacement proves a medical certificate or a license up to date. 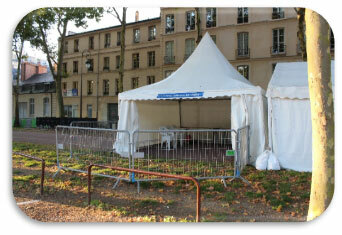 Located 300m from the finish line (avenue de Paris in Versailles), your space is open from 8:00am on the day of the race. cocktail-brunch : soft drinks, water, fresh juices, tea, coffee, mini sandwiches, wraps, pastries. © Paris-Versailles Association, tous droits réservés. Please note that this formula does not include race bibs.